“In whom also ye also are circumcised with the circumcision made without hands, in putting off the body of the sins of the flesh by the circumcision of Christ.” (Col. 2:11). 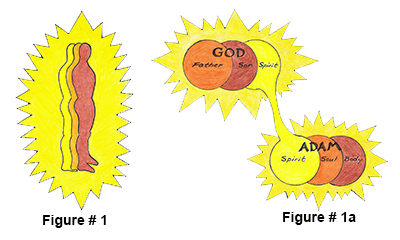 As we learned in the previous study entitled, “Spirit, Soul & Body” (under “Living the Bible” on the home page) man was created in God’s image, therefore, he is also a triune being, spirit, soul, and body “And the very God of peace sanctify you wholly; and I pray God your whole spirit and soul and body be preserved blameless unto the coming of our Lord Jesus Christ.” (1 Thess. 5:23) [Emphasis mine]. A simple analogy would be a football which has a leather cover (body) a rubber bladder (soul) and is filled with air (spirit). The soul has an invisible bodily form inside the physical body. Consider (Rev.6:9-11). Notice that after death the disembodied soul retains a definite shape which could be clothed with a robe. The soul of the rich man in hell (Luke 16:22-24) still has his senses; sight, sound, touch, and taste. This is not to say that Adam was a robot, controlled by God, but a spiritually minded being with free will, to which all things were possible. There was only one limitation placed upon Adam (Gen. 2:16-17). As we shall see, when Adam and Eve exercised their God-given free will to disobey, a crucial change occurred. A split second after the creature chose to defy his Creator an inward fatality occurred. Adam and Eve’s spiritual union with God was the first casualty of their disobedience…the departure of the Holy Spirit from their spirit rendered them spiritually dead, separated from God. As a result of the “Fall”, Adam and all his descendants were then, “dead in trespasses and sins…” (Eph.2:1). This death not only affected the spirit of man but also the soul and body. From this point on Adam’s physical body would gradually begin to deteriorate and eventually die, “for dust thou art, and unto dust shalt thou return.” (Gen.3:19). Without the light of the Holy Spirit to guide them (due to spiritual death), their fallen flesh (nature) becomes the dominating life force. Before the fall the priority and order was spirit, soul, and body…the spirit was the master, the soul was the steward and the body the servant. After the Fall the order was reversed; the body became the master, the soul remained the steward and the spirit became the servant. See “Adam Before and after the Fall” (under “Living the Bible” on Home Page). This is the meaning of (Eph. 2:1-3) “dead in trespasses and sins,” and (Rom. 7:5), “For when we were in the flesh” (prior to salvation). 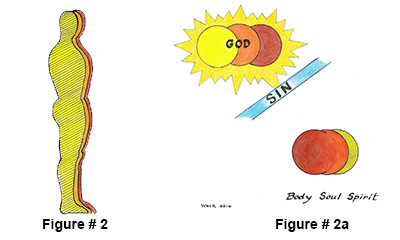 By comparing (Figure # 1 a) with (Figure # 2 a) we can see the threefold effect of Adam’s sin, spirit, soul & body. 1st – The Holy Spirit’s departure from man’s spirit resulted in the spiritual death spoken of in (Gen.2:17) “for in the day that thou eatest thereof thou shalt surely die.” Remember, Adam and Eve did not die a physical death the day they sinned, that occurred many years after the fact. Nor did man’s spirit cease to exist…it is dead in the sense that it is separated from God’s Spirit. 2nd – Adam’s soul was negatively affected by the Holy Spirits departure in that it merged with his body of flesh.Thereby joining the soul to the body of fallen flesh which has become the dominant life force. When a person, under the conviction of the Holy Spirit, repents of their sin and by faith trusts in Jesus’ substitutionary death (blood atonement) on their behalf, the word of God states that they are, “born again” (John 3:3). Jesus’ explanation of the second birth to Nicodemus (John 3:3-8) reveals that He was referring to a spiritual re-birth “born of the Spirit” (v. 8). The reason that Jesus is called the “last Adam” (1 Cor.15:45) is that He came to undo the curse of the first Adam. When Adam sinned he immediately experienced spiritual death (Gen. 2:17) later followed by a physical death (Gen.5:5). Upon salvation, a reversal occurs…the spirit is first quickened then the body at a future time (Rom.8:23, Phil. 3:21). As we earlier learned, Adam’s disobedience had a malignant effect on his entire being (spirit, soul, and body). The antidote to this inherited malady is found in the shed blood of the Lord Jesus Christ! The obedience of the “last Adam”; Jesus’ death, burial, and resurrection redeemed mankind and restored the original order of…spirit, soul, and body. “For as one man’s disobedience many were made sinners, so by the obedience of one shall many be made righteous.” (Rom.5:19). “Therefore if any man be in Christ, he is a new creature…” (2 Cor. 5:17). The Operation of God…Spiritual Circumcision. “And ye are complete in him, which is the head of all principality and power: In whom also ye are circumcised with the circumcision made without hands, in putting off the body of the sins of the flesh by the circumcision of Christ: Buried with him in baptism, wherein also ye are risen with him through the faith of the operation of God, who hath raised him from the dead.” (Col. 2:10-12). Salvation also involves a supernatural operation whereby the believer is placed into the body of Christ through a spiritual baptism (1 Cor.12:13). This baptism involves a “circumcision made without hands”( Col.2:11). In a nanosecond, the Holy Spirit literally cuts away man’s soul from the body of flesh permanently taking up residence…sealing him (Eph.1:13), so that two spirits become one “But he that is joined to the Lord is one spirit.” (1 Cor.6:17). In the eyes of God, every born again believer has been, “crucified with Christ” (Gal.2:20), thereby uniting them to His death, burial, and resurrection. For more information see the article entitled, “Co-crucifixion” under “Living the Bible” on the home page. 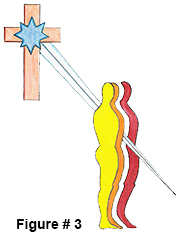 The “circumcision made without hands” is a supernatural operation made by the Holy Spirit cutting free the redeemed soul from, “the body of the sins of the flesh.” Figure # 3. Thereby restoring the priority and order of spirit, soul, and body (1 Thess.5:23) and creating a sanctuary within the believer separate from the corrupt body of flesh. This is the only way the Holy Spirit could indwell man without being joined to his sinful flesh! Under the Old Testament God dwelt in a tabernacle made with hands (Exodus 25). In the New Testament, He dwells in the tabernacle made without hands (within the believer). This is why the word of God refers to a saved person as the “temple of the Holy Ghost”: What? know ye not that your body is the temple of the Holy Ghost which is in you, which ye have of God, and ye are not your own? (1 Cor. 6:19) “Know ye not that ye are the temple of God, and that the Spirit of God dwelleth in you? (1 Cor.3:16). As a result of this spiritual operation, every born again believer has two diametrically opposed forces within. The Bible refers to them as the “new man” and the, “old man” (Eph.4:22-24). The “new man” is led by the Spirit and the “old man” by the flesh. In the next segment titled, “New Man Vs. Old Man” we will study the nature and terrain of this inner struggle.